A sparkling display from Ignatius Ang had Warriors cruising at half-time as the attacker scored one and set up a second, but the Eagles completely turned the game on its head on the hour mark. Amy Recha won and converted a penalty to spark a comeback, which was aided by Poh Yi Feng’s dismissal on 64 minutes. Yuki Ichikawa tapped in Amy’s low ball, before the pair swopped roles and Amy finished off Ichikawa’s header back across goal. Firdaus Kasman then squeezed a shot past the goalkeeper to put some daylight between the two teams, before Fareez Farhan tucked away the rebound after Amy’s shot had been pushed onto the post. – Geylang scored five goals or more in a game for the first time since November 2015 – also against Warriors then (a 6-0 league win). – Firdaus Kasman scored a league goal for the first time since June 2016, ending a 39-game drought. – Warriors have lost six consecutive league games for the first time in their history. 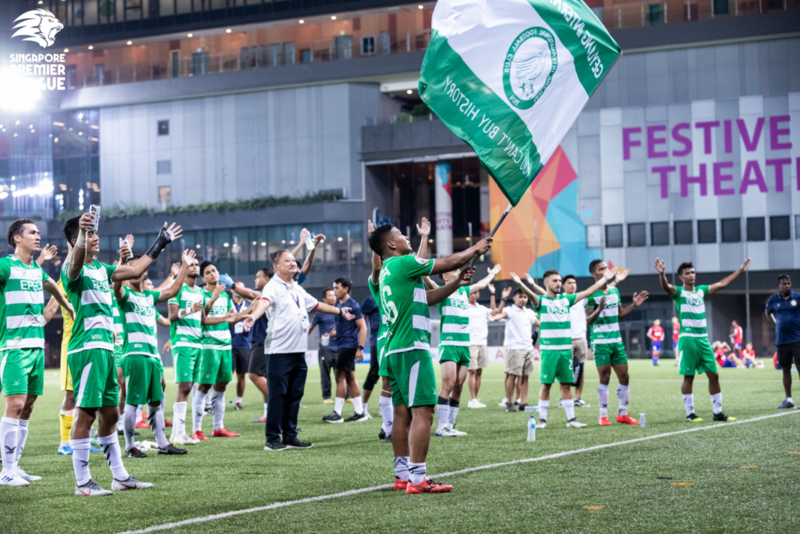 Geylang XI: Hairul Syirhan (GK), Yuki Ichikawa (C), Darren Teh (Anders Aplin 80’), Shahrin Saberin, Syahiran Miswan, Barry Maguire, Danish Irfan, Christopher van Huizen, Umar Akhbar (Firdaus Kasman 46’), Amy Recha, Ifwat Ismail (Fareez Farhan 32’). Unused subs: Zainol Gulam (GK), Jufri Taha, Noor Ariff, Corey Warren. Warriors XI: Riki Kimura (GK), Daniel Shafiq, Kento Fukuda, Tajeli Salamat, Emmeric Ong, Ryhan Stewart (Delwinder Singh 68’), Poh Yi Feng (C), Ignatius Ang (Sura Prakash 77’), Fairoz Hasan, Fadhil Noh (Gabriel Quak 52’), Jonathan Behe. Unused subs: Shahul Rayyan (GK), Yeo Hai Ngee, Sahil Suhaimi, Afiq Azrhy. 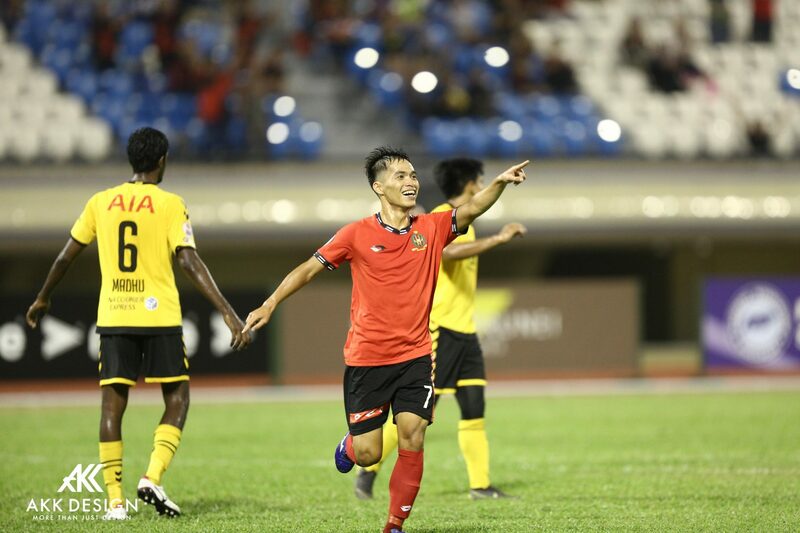 The Protectors continued their mini-revival by picking up a third straight win in all competitions and captain Izzdin Shafiq led the charge with the opener inside seven minutes. Having neatly sidestepped two challenges, the Singapore international then curled a beautiful effort into the top right corner from 25 yards. The visitors hit back within a minute as skipper Joshua Pereira headed in Syukri Bashir’s cross, but Adam Swandi ensured Home had the last laugh by tapping in Oliver Puflett’s cut-back. – Young Lions have now failed to beat Home in any of their last 12 meetings. – Izzdin’s last five goals have all come from outside the box. – Pereira scored the second league goal of his career; both were headers. Home XI: Nazri Sabri (GK), Faritz Hameed, Faizal Roslan, Abdil Qaiyyim, Juma’at Jantan, Izzdin Shafiq (C), Hami Syahin, Aqhari Abdullah (Hafiz Nor 73’), Adam Swandi (Ho Wai Loon 83’), Amiruldin Asraf (Song Uiyoung 63’), Oliver Puflett. Unused subs: Haikal Hasnol (GK), Iqram Rifqi, Nur Hizami Salim, Suhairi Sabri. Young Lions XI: Zharfan Rohaizad (GK), Zulqarnaen Suzliman, Syahrul Sazali, Lionel Tan, Joshua Pereira (C), Syed Firdaus (Gareth Low 46’), Jacob Mahler, Nur Luqman, Haiqal Pashia, Saifullah Akbar (Rezza Rezky 70’), Syukri Bashir (Naqiuddin Eunos 61’). Unused subs: Kenji Rusydi (GK), Asraf Zahid, Nur Adam, Abdul Rasaq. Relief came for Albirex on Saturday as they picked up their first win of the season thanks to a late show. The visitors started brightly and Kengo Fukudome made a smart stop to deny Akbar Shah, but could not get a touch to Huzaifah Aziz’s perfectly-placed free-kick on four minutes. The bar denied Kristijan Krajček from 25 yards, while Kyoga Nakamura’s corner was hacked off the line at the other end. The White Swans came out strongly after the break and Kaishu Yamazaki curled a free-kick off the upper right and Daizo Horikoshi saw a close-range effort brilliantly saved by Zaiful Nizam. The pressure paid off when Shoki Ohara thumped a header in off Nakamura’s corner and it got better with virtually the last kick of the game when Yoshikatsu Hiraga diverted Nurullah Hussein’s under-hit back-pass through Zaiful’s legs for the winner. 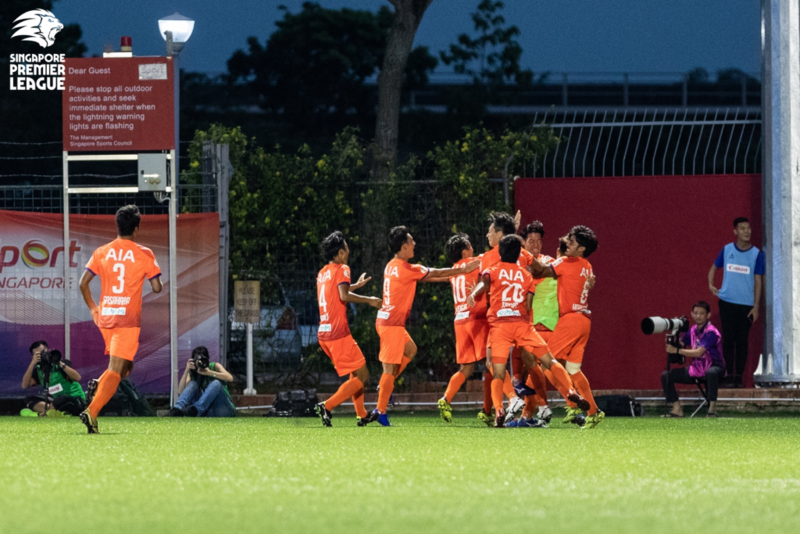 – Albirex have now won 11 of their last 12 encounters against Balestier. – By scoring their first goals of the season, Albirex ended their worst goal-less streak (three games) since August 2013. – Huzaifah scored the first free-kick goal of his career. Albirex XI: Kengo Fukudome (GK), Shuhei Sasahara, Naruki Takahashi, Shoki Ohara, Sota Sugiyama, Kaishu Yamazaki, Daizo Horikoshi, Zamani Zamri (Daichi Tanabe 46’), Daniel Martens (Yoshikatsu Hiraga 61’), Kyoga Nakamura (C), Hiroyoshi Kamata. Unused subs: Hyrulnizam Juma’at (GK), Gerald Ang, Firas Irwan, Kodai Sumikawa, Shunsuke Fukuda. Balestier: Zaiful Nizam (GK)(C), Fadli Kamis, Nurullah Hussein, Ahmad Syahir, Fazli Shafie (Illyas Lee 46’), Huzaifah Aziz, Raihan Rahman, Daniel Goh, Hazzuwan Halim, Kristijan Krajček (Fariz Faizal 63’), Akbar Shah (Sanjin Vrebac 46’). Unused subs: Faris Danial (GK), Khalili Khalif, Sufianto Salleh, Sameer Alassane. Adrian Pennock masterminded Tampines’ first defeat of the season as his charges edged a tight contest at home to remain the only unbeaten side. Andrei Varankou started and ended a slick move for the opener, swinging the ball wide right to Abdul Azizi Rahman before arriving at the far post to place a low finish into the bottom right. The Belarussian’s deft flick then set up Azwan Ali Rahman to curl a fine finish past Syazwan Buhari, but Khairul Amri’s fantastic strike from a tight angle gave the Stags hope. Amri could have capped a super-sub outing late on but Wardun Yussof made a match-winning save to thwart the Singapore international. – DPMM have won five straight league games at home, their best run since September 2016 (also five). – DPMM are now unbeaten in 11 league games – a club record. 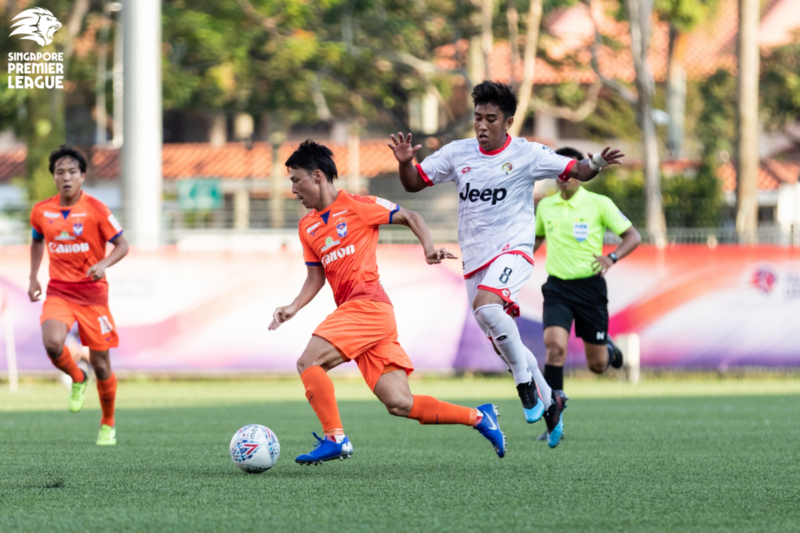 – Tampines’ last away defeat was also a 2-1 loss at the same venue, in September 2018. – Amri became the first player to score against DPMM this season. DPMM XI: Wardun Yussof (GK)(C), Helmi Zambin, Yura Indera Putera, Charlie Clough, Abdul Mu’iz Sisa (Suhaimi Sulau 76’), Shah Razen Said, Nurikhwan Othman, Azwan Ali Rahman (Hendra Azam 82’), Blake Ricciuto, Andrei Varankou, Abdul Azizi Rahman (Razimee Ramlli 80’). Unused subs: Haimie Nyaring (GK), Wafi Aminuddin, Awangku Fakharrazi, Azwan Saleh. Tampines XI: Syazwan Buhari (GK), Madhu Mohana, Amirul Adli, Daniel Bennett, Irwan Shah (Taufik Suparno 76’), Yasir Hanapi, Shahdan Sulaiman (C), Shah Shahiran (Zehrudin Mehmedović 57’), Ryutaro Megumi, Jordan Webb, Zulfadhmi Suzliman (Khairul Amri 46’). Unused subs: Zulfairuuz Rudy (GK), Akmal Azman, Hamizan Hisham, Elijah Lim.